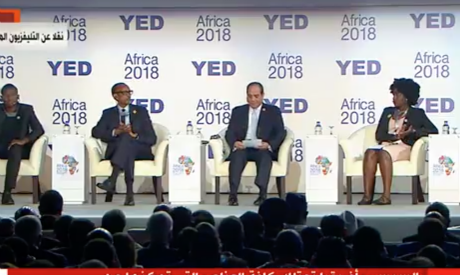 Egypt’s President Abdel-Fattah El-Sisi asked young entrepreneurs during the Africa 2018 Forum to “turn their ideas into reality” for both themselves and the African continent. El-Sisi spoke in a speech during the opening of the event, which is being held in Sharm el-Sheikh. “We stress that you are the most valuable asset to the continent. You are the drive and energy to create a better future for our continent,” El-Sisi said. He presented Egypt’s efforts in providing support for entrepreneurs both in the country and Africa. El-Sisi said state institutions unified efforts to establish the first regional centre in Egypt to support start-ups and train youth through entrepreneurship. He said an Arab-African Fund was also created to support such youth-led projects. Around 10,000 Egyptian and African youth will be trained in digital technology in the next three years, according to El-Sisi. “The challenges faced by the global economy call us to boost entrepreneurship in Africa, and to empower youths,” he added. The President also outlined legislation by Egypt to support entrepreneurship, including two laws regulating ride-hailing services in the country, as well as regulating food trucks. El-Sisi spoke about Fekretak Sherketak, a nationwide initiative which aims to support and accelerate the growth of entrepreneurs to develop innovate businesses in today’s competitive economy. The first state-sponsored initiative will provide more than 450 sessions of assistance to young business owners. Fifty start-ups have been established and funded, under Fekretak Sherketak’s flagship program -- Falak Startups. El-Sisi pointed also at the World Bank’s International Finance Corporation’s Next 100 African Startups competition, which takes place from 8-9 December and is organized in cooperation with Egypt’s Ministry of Investment and International Cooperation. The competition will see both entities selecting 100 promising startups from across the continent and connecting them with business leaders, international investors, and financial institutions. “My sons and daughters of the continent, we believe in you and your dreams. You are our hope and future. I ask you for hard work, thinking out of the box, and confidence in yourself to turn your ideas into reality,” he said. Around 41 Prime Ministers from the COMESA group are attending the forum, which will see discussions on infrastructure, entrepreneurship, investment, and women-related issues across the African continent.